هواویزها ذرات کوچک معلق در هوا در حالت جامد یا مایع هستند که ریشه پیدایش آنها در اثر عوامل طبیعی یا انسانی می‌باشند. امروزه تخمین عمق نوری هواویز‌ها به کمک داده‌های ماهواره‌ای قابل حصول است اما بدست آوردن آن به دلیل بازتابش‌های اتمسفری کار راحتی به شمار نمی رود. زیرا نور خورشید توسط سیستم اتمسفر بازتاب می‌شود و تمام آن به سطح زمین برخورد نمی کند. از جمله روش‌های موجود برای بدست آوردن پارامتر هواویز، روش‌های DDV(Dark Dense Vegetation) ،Deep Blue Algorithm و روش SYNegry of Terra and Aqua Modis) SYNTAM)می‌باشند. روش SYNTAM با ادغام داده‌های سنجنده MODIS دو سکوی AQUAوTERRA توانسته است محدودیت‌های موجود در بدست آوردن ضخامت نوری هواویز را از بین ببرد و نتایج درستی را در اختیار قرار می‌دهد. در این مقاله با استفاده از روش SYNTAM نقشه ضخامت نوری هواویزها، برای منطقه‌ای از ایران تهیه شده است. مقایسه نتایج بدست آمده از این تحقیق با محصول AOT ناسا برای زمان و موقعیت یکسان رضایت بخش می‌باشد. مقدارRMSE حاصل از مقایسه داده‌های NASA و روش SYNTAM به کمک الگوریتم تکرار نیوتن برای طول موج mm0.55 برابر 253/0 می‌باشد. بنابراین روش SYNTAM به عنوان روشی قوی برای بدست آوردن نقشه ضخامت نوری هواویز در مناطقی که فاقد ایستگاه‌های زمینی AERONET هستند معرفی می‌گردد. در قسمت بعد روش SYNTAM با سرشکنی مدل پارامتریک غیر خطی تلفیق می‌شود که نتایج حاصل از آن دارای دقت بیشتری نسبت به روش پیاده سازی روش SYNTAM به تنهایی است. مقدارRMSEحاصل از مقایسه داده‌های NASA و روش SYNTAM به کمک سرشکنی مدل پارامتریک غیر خطی، برای طول موج mm0.55 برابر 207/0 می‌باشد. Aerosols are small (sub-micron to several microns) suspended particles in the solid or liquid phase in the atmosphere. The main origins of aerosols are natural and anthropogenic. They can be directly emitted as particles (primary aerosols) into the atmosphere namely, mineral aerosol, sea salt, volcanic eruptions, organic aerosols, industrial dust, soot, biomass burning, etc. They can also be the result of chemical reactions (secondary aerosols) namely, sulfates from biogenic gases or volcanic and nitrates from transportation and diffusion of aerosol particles from the source region depend on wind vector and wind strength. Aerosols are ever present and highly varying constituents of our atmosphere. They play roles in many physical and chemical processes that shape the composition of the atmosphere and thereby affect cloud formation, visibility, and air quality. They interact both directly and indirectly with radiation and thus affect the amount of radiative energy reaching the surface and reflected to space. The shortwave part of the radiative energy at the surface (insolation) is an important component of the surface energy budget, and a necessary input to models of land-surface processes. Aerosol Optical Thickness (AOT) is calculated by measuring light absorption at specific wavelengths of the visible spectrum. For the most widely used AOT data product, the absorption at 550 nm is the preferred wavelength for measurement (In the visible spectrum, humans perceive a light wavelength measuring 550 nm as a shade of green). AOT is a dimensionless quantity, expressing the negative logarithm of the fraction of radiation (e.g., light) that is not scattered or absorbed on a path. High AOT indicates a large quantity of aerosols, and thus a significant amount of absorption and scattering of radiation (i.e., light). Low AOT indicates clearer air with fewer aerosols and increased transmission of radiation. Increasing aerosol concentrations can thus affect global temperature and the radiation balance of the globe by reducing the amount of radiation reaching the Earth’s surface, and that reduction can result in lower air temperatures. Penetration of the large particles into the atmosphere in certain cases leads to decreasing the particles mobility and then dropping the conductivity, which will increase the electric field but aerosol measurements in the seismically active zones are more complicated due to the mosaic character of the gas emanation in the seismic zones and the uncertainty of aerosol origin in gas probes. Some remote sensing satellites due to their suitable temporal, spatial and spectral resolutions provide useful information of time and spatial distributions of Aerosols. This leads to creating an appropriate database for statistical study of the seismic atmospheric effects. The AOD measurement is taken by the MODIS sun-synchronous instrument onboard Terra and Aqua satellites every day. The satellites provide more continuous coverage nearer to the poles but there are more gaps in the coverage of the satellite nearer to the equator. AOT can be determined by implementing different methods on satellite images, but it is a difficult task to achieve it because solar lights are reflected by the atmosphere and the whole solar lights do not hit the ground. The most famous methods used to derive aerosol parameters are Dark Dense Vegetation (DDV), deep blue algorithm and synergy of Terra and Aqua MODIS (SYNTAM). SYNTAM approach can remove limitations in deriving AOT by combining data from two sensors of MODIS of TERRA and AQUA satellites and this method gives the right results. In this study, SYNTAM method has been applied over a region of Iran to produce an AOT map. The comparison between our results and NASA AOT products for the same time and location shows a good agreement. The result of comparing NASA data and SYNTAM approach with Newton iteration algorithm for the wavelength of 0.55 µm, gives the RMSE equal to 0.253. Therefore SYNTAM could be a robust method to derive AOT map over regions without AERONET ground stations. In the next section, SYNTAM method was combined with nonlinear parametric adjustment model. In this case, the results are more accurate than implementation of SYNTAM method alone. The result of comparing NASA data and SYNTAM approach with nonlinear parametric adjustment model for the wavelength of 0.55 µm, gives the RMSE equal to 0.207. 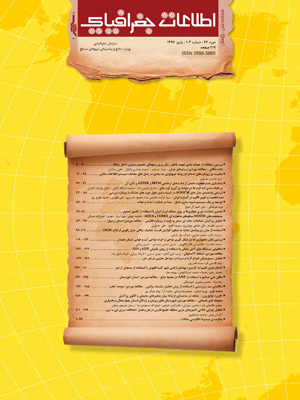 1- قربانی، رضوان (1390)، اعتبار سنجی داده‌های سنجنده مودیس در رابطه با آلودگی‌های جوّی در مناطق شهری، پایان‌نامه کارشناسی ارشد سنجش ازدور به راهنمایی دکتر محمدرضا مباشری، دانشکده نقشه‌برداری، دانشگاه صنعتی خواجه نصیرالدین طوسی. 2. Bhaskaran,S. Phillip,N. Rahman,A. Mallick,J. (2011), Applications of Satellite Data for Aerosol Optical Depth (AOD) Retrievals and Validation with AERONET Data, 1,61-67. 3. Chandrasekhar, S. (1960), Radiative transfer. New York7 Dover Publication. 4. Charlson,R.J. Langner ,J. Rodhe,H. Leovy,C.B. and Warren,S.G. (1991), Perturbation of the northern hemisphere radiative balance by backscattering from anthropogenic sulfate aerosols,Tellus, 152-163. 5. D’Almeida,G.A. Koepke,P. Shettle,E.P. (1991), Atmospheric aerosols, global climatology and radiative characteristics,Deepak Publ, pp.561. 6. Flowerdew,R. Haigh,J. (1995), An approximation to improve accuracy in the derivation of surface reflectance from multi-look satellite radiometers. Geophysical Research Letters, 22, 1693– 1696. 7. Iqbal,M. (1983), An introduction to solar radiation. Toronto, Canada7 Academic Press. 8. Kaufman,Y.J. Tanri,D. Remer,L.A. Vermote,E.F. Chq,A. Holbenl,B. N. ( 1997), Operational remote sensing of tropospheric aerosol over land from EOS moderate resolution imaging spectroradiometer. 9. Kontratyev,K.Ya. (1969), Radiation in the atmosphere. New York 7 Academic Press. 10. Li,Z.Q. et al. (2007), Aerosol optical properties and their radiative effects in northern China. J. Geophys. Res., Atmos. 112 (D22). 11. Linke,F. (1956), Die Sonnestrahlung und ihre schwachung in der atmosphere. in handbuch der geopgyisk, Bd VIII,herausgeg.von F.Linke F.Moeller, (Berlin: Gebr. Borntraeger), kap. 6, 1942–1956. 12. Myhre,G. et al. (1998), Estimation of the direct radiative forcing due to sulfate and soot aerosols,Tellus B 50 (5), 463–477. 13. Penner,J.E. et al. (1994), Quantifying and minimizing uncertainty of climate forcing by anthropogenic aerosols. Bull. Am. Meteorol. Soc. 75 (3), 375–400. 14. Pope III,C.A. et al. (2002), Lung cancer, cardiopulmonary mortality, and long-term exposure to fine particulate air pollution. JAMA J. Am. Med. Assoc. 287 (9), 1132–1141. 15. Tang,J. Xuea,Y. Yuc,T. Guan,Y. (2005), Aerosol optical thickness determination by exploiting the synergy of TERRA and AQUA MODIS,328 ,327–334. 16. Tanre,D. Herman,M. Deschamps,P.Y. De Leffe,A. (1979), Atmospheric modeling for space measurements of ground reflectances including bi-directional properties. Applied Optics, 18, 3587– 3594. 17. Veefkind,J.P. de Leeuw,G. Durkee,P.A. (1998), Retrieval of aerosol optical depth over land using two-angle view satellite radiometry during TARFOX, Geophysical Research Letters, 25, 3135– 3138. 18. Veefkind,J. P. de Leeuw,G. Koelemeijer,R.B.A. Stammes,P. (2000), Regional distribution of aerosol over land derived from ATSR-2 and GOME data, Remote Sensing of Environment, 74, 377– 386. 19. Wang,Z. Chen,J. Tao,Y. Zhang and Su,L. (2010), Satellite-based stimation of regional particulate matter (PM) in Beijing using vertical-and-RH correcting method. Remote Sensing of Environment, 114, 50–63. 20. Xue,Y. Cracknell,A.P. (1995), Operational bi-angle approach to retrieve the earth surface albedo from AVHRR data in the visible band. International Journal of Remote Se. Yang ,L. P. Yamaguchi,Y. (2010), Retrieval of aerosol optical depth over urban areas using TERRA/MODIS data, 1, International Archives of the Photogrammetry, Remote Sensing and Spatial Information Science, Volume XXXVIII, Part 8.nsing, 16, 417– 429.